A growing volume of vessels transit through and around offshore assets, and operators must reduce the risks that these vessels pose to people and operations. Risks vary, but mitigation is imperative to head off safety incidents, production losses, and the immense reputation damage of a disaster. Many operators are now improving risk awareness and mitigation with solutions that combine Automatic Identification System (AIS) data with radar and location-specific real-time input from multiple asset sites to create a common operational view of vessel activity. 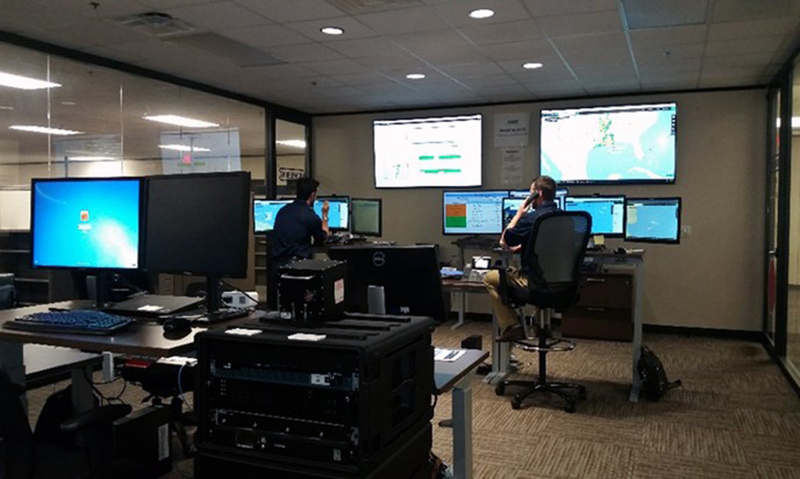 All live data feeds are monitored around the clock at a central shore-side location by teams that are specially trained to assess alerts, make initial risk assessments, and communicate only validated risks to offshore watch-standers for immediate action. These solutions facilitate timely alerts to watch-standers and provide critically important technology for issuing warning messages directly to the vessel’s captain and crew. Operators can more effectively avert dangerous incidents while also improving the efficiency of their risk-mitigation operations. There is no room for error offshore, especially where human welfare is concerned. Maximizing productivity is also critical as operators look to reduce project costs – and, even with stable oil prices and favorable weather, unexpected operational threats can easily upend economic models. A 2016 study by Kimberlite International Oilfield Research estimated that just 1 percent of unplanned downtime, or 3.65 downtime days per year, can cost organizations $5.037 million each year. While this estimate focuses on the costs of unplanned maintenance, a vessel’s impact with a platform can be equally – if not more – damaging and is considered a more serious threat than impacts between vessels. A July 2018 study by the U.S. Bureau of Ocean Energy Management found that, while collisions in the Gulf of Mexico and the Pacific are most likely to occur between tankers or offshore supply vessels (OSVs), those incidents leading to oil spills are likely to be between vessels and platforms. Until recently, it was assumed that mitigation options were limited. As the UK HSE noted in its ship/platform collision incident database report, the potential for a passing vessel to collide with an installation is, to a large extent, outside the control of the installation operator and its attendant standby vessel – though, if timely action is taken to warn an errant vessel, it may be possible to influence the vessel’s actions. Traditional collision monitoring and warning programs simply cannot facilitate timely enough warnings, and these programs typically use radar “guard rings” that, if too large, flood watch-standers with false alarms. If the rings are too small, then risks cannot be identified soon enough to mitigate them. The process of warning vessels is also challenging and has generally included trying to make VHF/radio contact while also dispatching a standby vessel or helicopter to a position between the threat and the platform. Most major offshore operators have already employed AIS data to monitor vessel activities for logistical and safety reasons. Now they are also applying the technology to consolidate all activities related to assessing vessel risks and alerting offshore crews in time to take appropriate action. This centralized approach at an onshore location also creates the opportunity to establish remote watch teams with a consolidated view of all assets worldwide. Organizations can allocate the proper attention to identified risks while improving how information is managed. An important step in deploying a centralized risk monitoring and mitigation platform is to ensure access to all necessary information for each defined risk so that operators can employ sophisticated risk profiling models that factor in such data as the type, size, and speed of passing vessels in nearby shipping lanes, as well as their energies, transit times, and closest points of approach in any given lane. This data is critical for clearly defining risk assessments, developing mitigation policies and procedures, and analyzing scenarios, such as whether an incoming vessel is under power or drifting, which may require a controlled shutdown and evacuation. The system is then tapped for historical data about past incursions into a zone of interest, including all necessary speed statistics. Risk assessments should be revisited on an ongoing basis as risk factors change. Consider, for instance, the changes ahead for Gulf of Mexico vessel traffic patterns as new assets come online following Mexico’s opening of its oil sector to foreign investment, and with the addition of new shipping routes from the Panama Canal to U.S. ports. Other changes may come with the construction of the first oil-exporting terminal – to be located off the coast of Corpus Christi, Texas – for the world’s largest crude-carrying vessels. The system also must be capable of configuring and issuing automated alerts based on each asset’s predetermined risk parameters. Alerts must only be triggered when multiple criteria are met, such as when a vessel reaches or exceeds a given speed or strays outside a shipping lane. One of the biggest challenges is filtering out false-positive alarms so that offshore teams must only deal with alerts related to relevant threats. Today’s solutions provide all information necessary to deliver a complete offshore picture, enabling specialized software to filter out false-negative alarms. It is not necessary for the asset to be on a nautical chart to assess and mitigate vessel threats, as all necessary information can be added to the monitoring platform. An example of this type of situation is the December 2017 collision of the chemical tanker Elsa Essberger with an unmanned and out-of-service offshore platform in the Dutch North Sea. Figure 1 shows a historical playback of the vessel’s movements, using the Oceaneering® PortVision® 360 service. Although little more than five minutes elapsed from when the tanker left the shipping lane to its collision with the platform, this would have been enough for a shore-side team with a comprehensive operational view to assess the risk and contact the vessel. Figure 1: Historical playback of the collision of the chemical tanker Elsa Essberger with an unmanned, out-of-service offshore oil platform in the Dutch North Sea. Another important hardware option is to deploy an AIS Aid to Navigation (ATON) that can be programmed to proactively send a safety message directly to an approaching vessel’s wheelhouse. This would have been particularly valuable in the Elsa Essberger incident. A similar example is the January 2015 Gulf of Mexico strike of an unmanned drilling platform by the Connor Bordelon offshore supply vessel (OSV), which ruptured oil and gas pipelines connected to the platform and caused them to catch fire. The U.S. National Transportation Safety Board (NTSB) said that the probable cause of the allision was the failure to maintain a proper lookout, along with a delay in changing from autopilot to manual steering. Figure 2 is a historical playback of the incident, showing how near-real-time vessel tracking combined with direct ATON-based messaging would have enabled the shore-side monitoring team to advise the incoming vessel to change course. Figure 2: Historical vessel-tracking playback of the Connor Bordelon allision with the platform South Timbalier 271A on January 23, 2015. It is vital that the monitoring and mitigation systems support comprehensive and accurate reporting for all incidents, near misses, and triggered alerts so that operators can assess risk probability and whether controls are effective or need modification. This information, combined with historical vessel position data, enables operators to enhance program efficiency and emergency responses while also facilitating the ongoing measurement of key performance indicators (KPIs). Measuring KPIs enables operators to continuously improve best practices for program effectiveness and to target specific vessels for outreach and education, as necessary. Once best practices are established for one set of assets, operators can use them with any type of critical infrastructure. The information is also valuable when legal action is required, as prosecution generally requires a high standard of proof. All lessons learned from investigations and follow-ups can be shared with installation and vessel personnel, owners, other operators, and industry organizations, to the benefit of all. In addition to improving risk management, centralized monitoring platforms increase the value of hardware deployed to individual assets by providing overlapping regional coverage and helping to prevent blind spots or gaps in early assessments. They also increase the effectiveness of platform watch-standers at the front line of mitigation, improving their situational awareness and giving them better tools for communicating and engaging with incoming vessels that pose a threat. Perhaps most importantly for operators with multiple assets, these platforms facilitate risk management across many geographically dispersed locations. Incorporating additional location-specific real-time data from each asset site into a centralized platform facilitates a common operational view of multiple regional assets. There are two ways to deploy a program – using in-house resources, or by outsourcing the function to a third party. The latter approach can be particularly effective for organizations that must do more with less in today’s cost-competitive operating environment. Some operators have the processes and resources to deploy their own shore-side AIS-based monitoring programs, along with experienced personnel who can be dedicated to the task of determining and initiating mitigating actions. Others have insufficient staff to monitor the huge influx of information, validate triggered alerts, and respond to them. For these operators, it is more effective to outsource 24/7 AIS-based risk monitoring and evaluation to a professional third-party shore-side operation as a first line of defense to ensure that proper attention is always on critical and actionable issues. Virtual watch-standers monitor all assets from a shore-side location where they have a common operational view of vessel activity. Other operators may choose the outsourcing route to eliminate what previously may have been a substantial variance in risk-management training, team size, and operational tempo across all platforms. Outsourcing a shore-side operation enables them to apply risk-management policies and procedures more consistently across all assets, while greatly improving awareness of approaching vessel risks and providing much earlier awareness about asset threats for speedier initiation of risk-mitigation measures. The third-party team can also monitor hardware and network health, which is critical for ensuring the integrity of this type of unified monitoring configuration. A system map of all key hardware, data feeds, network connections, and servers supporting the platform provides the foundation for developing a network “health” dashboard that can monitor each key failure point and alert watch-standers when there is any condition that would render the system ineffective. Oceaneering is exploring whether the same risk monitoring and mitigation approach can be applied to other types of offshore asset threats, such as the presence of icebergs or pirate vessels, and to other types of offshore assets, such as wind farms. There is also the opportunity to add other types of data inputs from sources such as drones, Light Detection and Ranging (LIDAR) sensors or Forward-Looking Infrared (FLIR) cameras to further improve situational awareness. Centralized asset monitoring platforms ensure that trained and experienced professionals are dedicated to the risk-management process and are using the same consistent set of procedures and tools across an operator’s entire asset infrastructure. Best practices are always improving across all assets, and operators can generate higher-value operational insights as they continuously enhance their visibility and the efficiency and effectiveness of their risk-mitigation efforts.